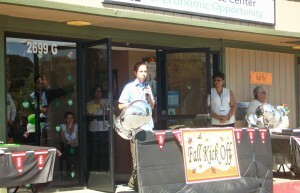 Leadership Council Member Dave Thompson addresses the crowd at the Micheal Chavez Center Fall Kickoff! On a sweltering September day in Concord, the Michael Chavez Center opened its doors and shared what it had to offer to the Monument Corridor. Named after former Councilmember Michael Chavez, who made it his mission to improve the quality of life for residents of the city of Concord, the Chavez Center works to provide jobs to the low-income community along the Monument Corridor. They offer services in areas such as day labor and civic integration, technology, and career development, skills that help give members the confidence and ability to pursue long-term employment. The Sept. 28th Open House featured organizations that work in partnership with the Chavez Center, like the Monument Community First 5 Center and The Stride Center. Participants were able to get a tour of the Center, visit with affiliate organizations, and enter a raffle for prizes such as an autographed football from Raider’s Linebacker Sam Williams, who came in the afternoon to give an inspiring speech. Read about Williams’ Open House experience on the Oakland Raider’s Website. As a HAB45 Leadership Council member organization, the Michael Chavez Center is also working to develop a Concord Urban Farm, an organic oasis that will provide an opportunity to teach farming skills and educate adults and kids about healthy eating. This project promotes Principle 2 of the HAB45 Action Plan to increase access and availability of healthy foods to the community and will also provide a source of income to local farmers. To learn more about the Concord Urban Farm, visit the Micheal Chavez Center poster during the 2010 Community Summit. To view more pictures of the Micheal Chavez Center Open house visit the HAB45 Facebook page. You can also become a fan of Micheal Chavez Center’s Facebook Page, or visit their website at: http://www.monumentfutures.org/. food access, partners, success, Summit 2010 community garden, day labor, First 5 Center, food access, HAB45 Community Summit, jobs, Michael Chavez Center, Monument Corridor, Oakland Raiders, Stride Center, training. permalink.